This article examines some of the ammunition used for the 105mm howitzer, the various ways it was packaged, and how 1/35 scale ordnance compares to the real thing. Modelers who wish to make their own decals for boxes and tubes should find this useful for creating realistic markings. The M2 105mm howitzer was incorporated in the U.S. Army inventory in the early 1930s as the primary divisional artillery weapon. Self-propelled and lightweight airborne versions were developed during WWII and the 105mm howitzer became the most produced U.S. artillery weapon of WWII. During the war, 18.1% of all artillery ammunition expended in combat by the U.S. was the 105mm HE M1 with the M48 or M54 fuze, with another 2.5% being unfuzed HE rounds. One out of every five shells fired by the U.S. Army during the war was 105mm HE. It truly was THE most common round. The howitzer used "semi-fixed" ammunition where the projectile was loaded into the weapon with the metal cartridge case as a single round, but it could be separated to adjust the powder charge. The rounds were individually packed in fiber (cardboard) containers then packed in a variety of outer containers. 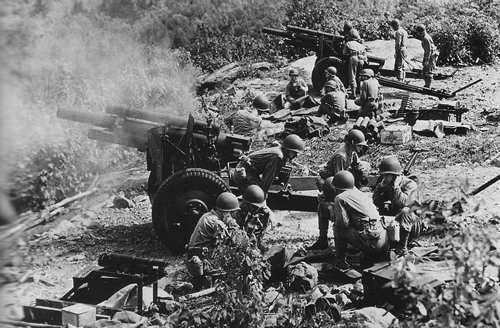 Initially 105mm ammunition was packed in two-round wooden boxes, but switched to three-round bundles starting in 1941. Because of problems with damage to the ammunition and difficulties in handling the heavy bundles (which weighed more than 150 pounds) in 1943 a "short" two-round wooden box (weighing a mere 120 pounds) was introduced that packed projectiles and cartridge cases in separate fiber containers. This added burdens at the firing site and risked loss of lot traceabilty so in early 1944 it was recommended that two-round "long" wooden boxes replace the bundles and short boxes. Despite the changeover, three-round bundles still appeared in ammunition supply catalogs as late as 1951. Finally, for shipment to tropical areas a single-round metal can was created and entered service in early 1944.